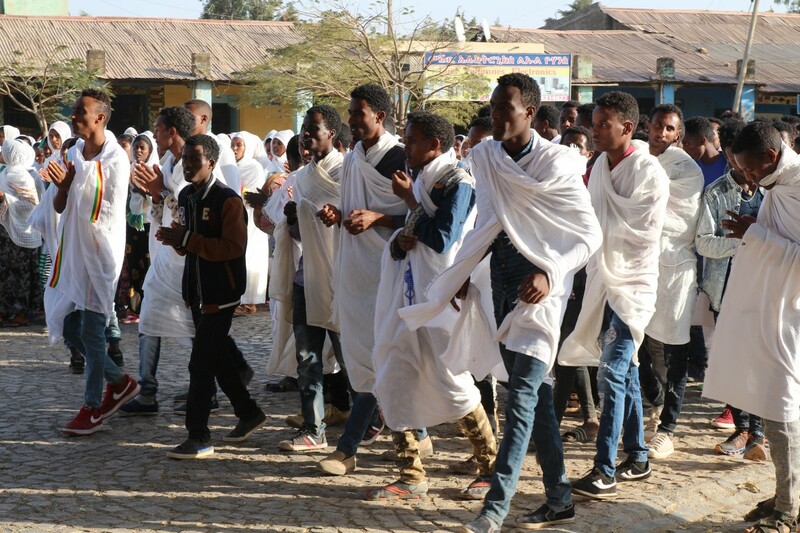 Hundreds of people dressed in white robes line the streets of Aksum, chanting, dancing and clapping their hands for Ethiopian Timkat. 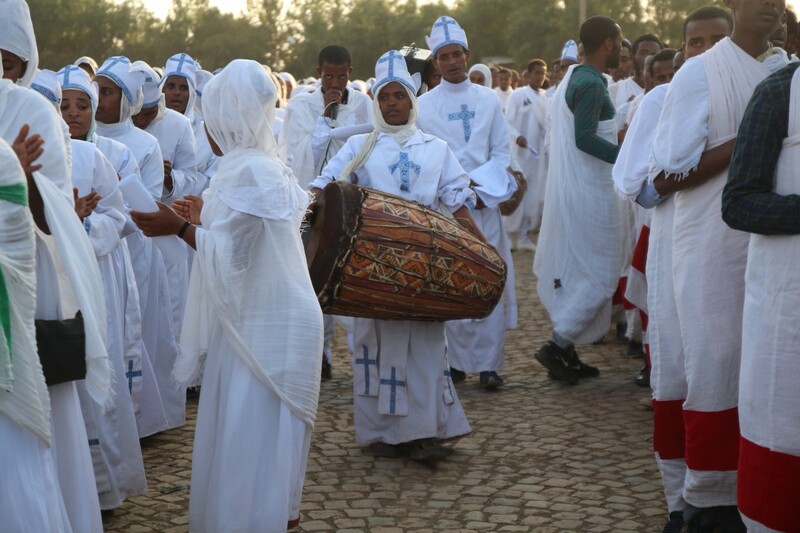 The Timkat ‘epiphany’ festival celebrates the baptism of Christ. 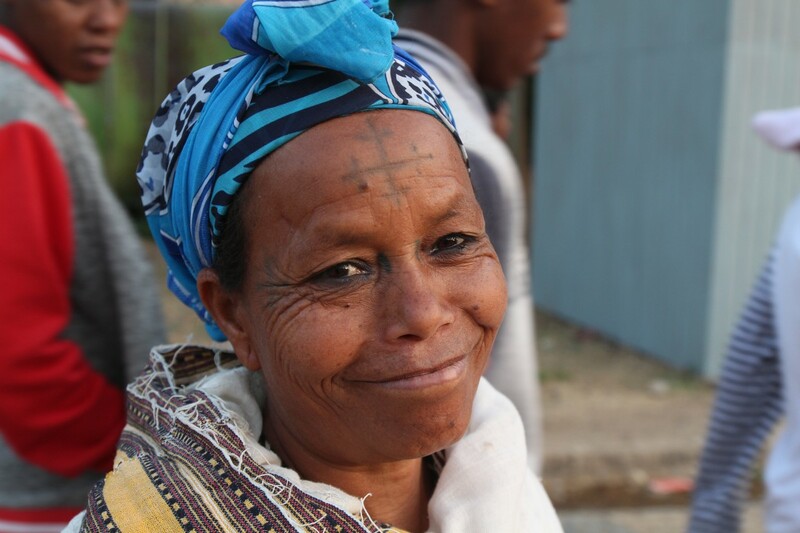 As the majority of Ethiopia’s population belongs to the Orthodox church, Timkat is deeply important for them. 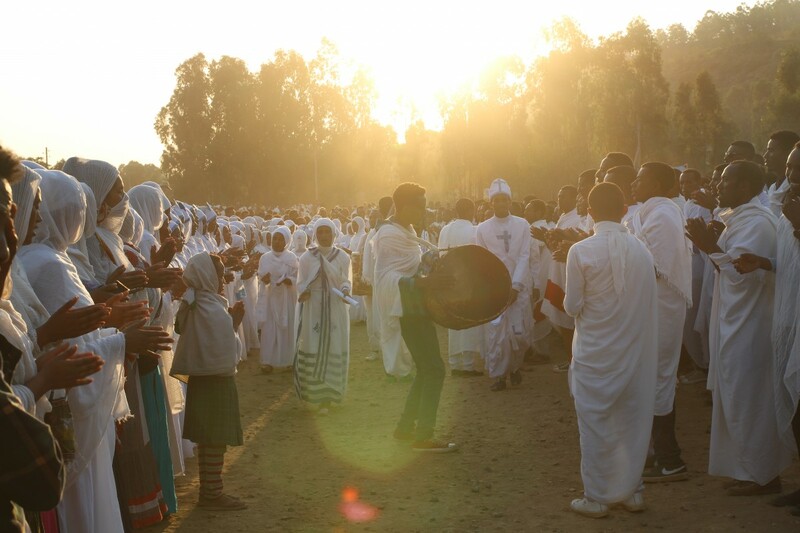 I was lucky enough to backpack throughout Ethiopia during the festival! 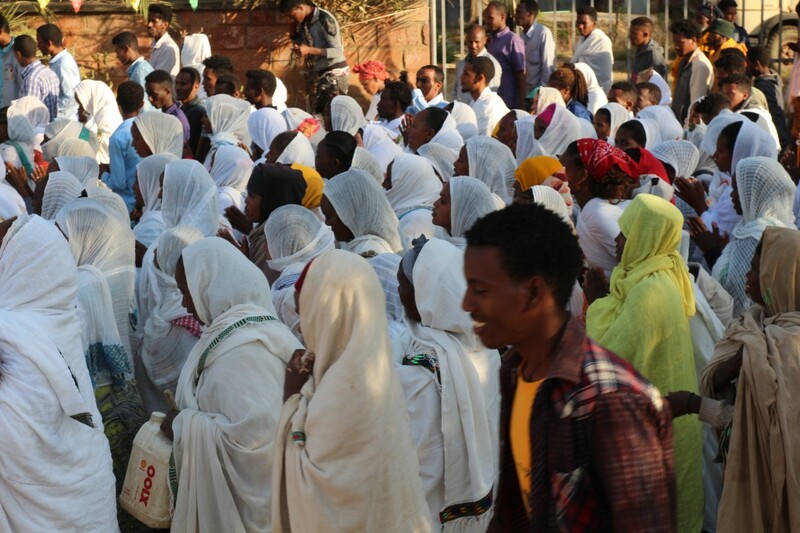 Timkat (or Timket) is officially a three-day event, which begins from January 18th. It starts with the procession of ‘tabots’ (holy replicas of the Ark of the Covenant) to a body of water in the afternoon of the first day. 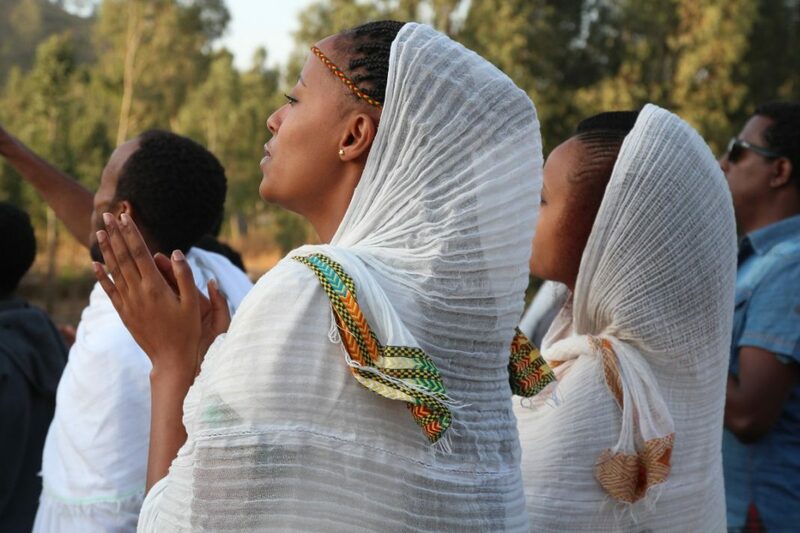 In Aksum, this body of water is the Bath of Queen Sheeba. 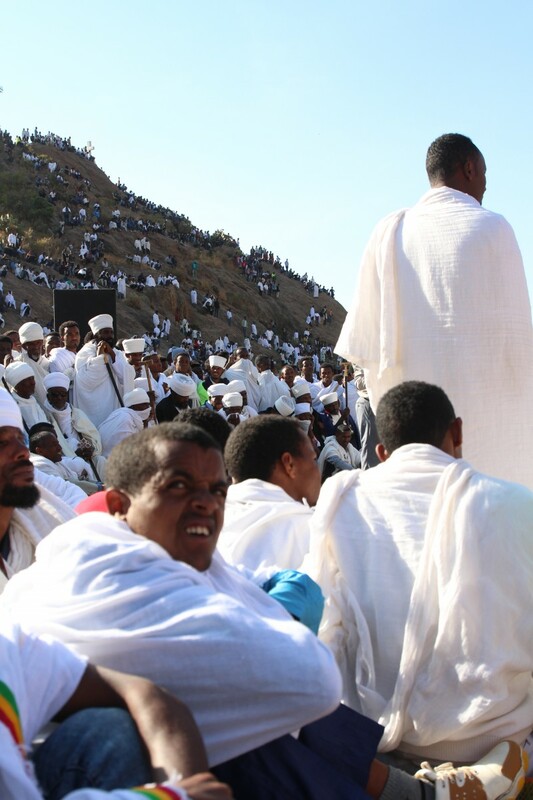 The festivities around the Bath of Queen Sheeba go on through the night with singing, praying and burning candles and incense. The next morning, the crowds gather again for colorful ceremonies and more prayers. After this, the tabots are paraded back to the church and the church leader blesses the pool of water. When the priests are done, it is finally time for the annual baptism. This is point where everyone gets excited: people jump into the holy water or try to get a bit of water on their forehead from the big water sprays. 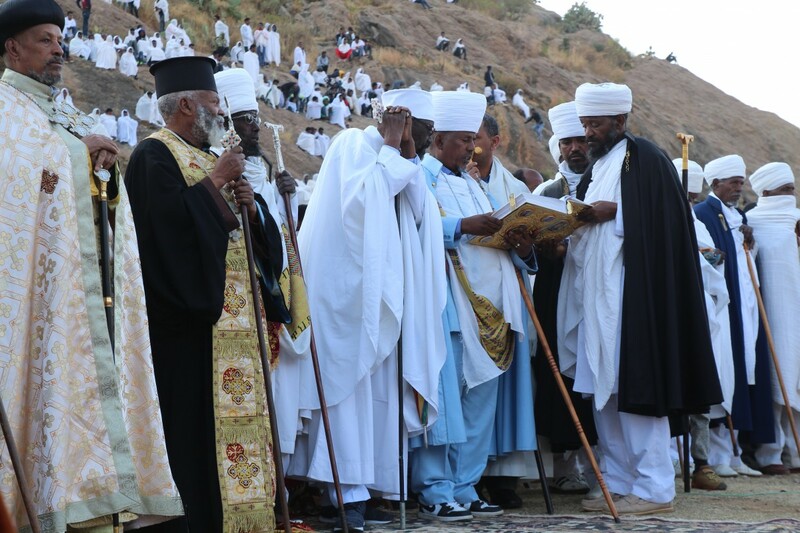 I felt incredibly honored and lucky to be part of this unique event, which is so important for the Ethiopian Orthodox people. 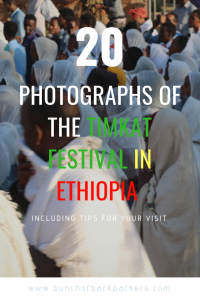 Find tips for your visit to the Ethiopian Timkat festival at the end of this article. 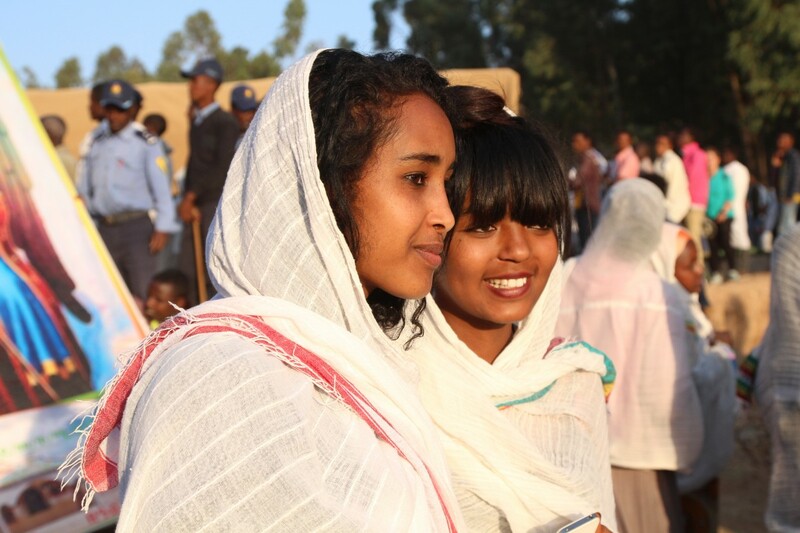 Two Ethiopian ladies during the Timkat Festival in Aksum. Copyright Bunch of Backpackers. Music during the Timkat festival. Timkat festival Ethiopia. Copyright Bunch of Backpackers. Kids during the Timkat festival. Timkat festival Ethiopia. Copyright Bunch of Backpackers. Dancing and singing during the Timkat festival. Timkat festival Ethiopia. Copyright Bunch of Backpackers. 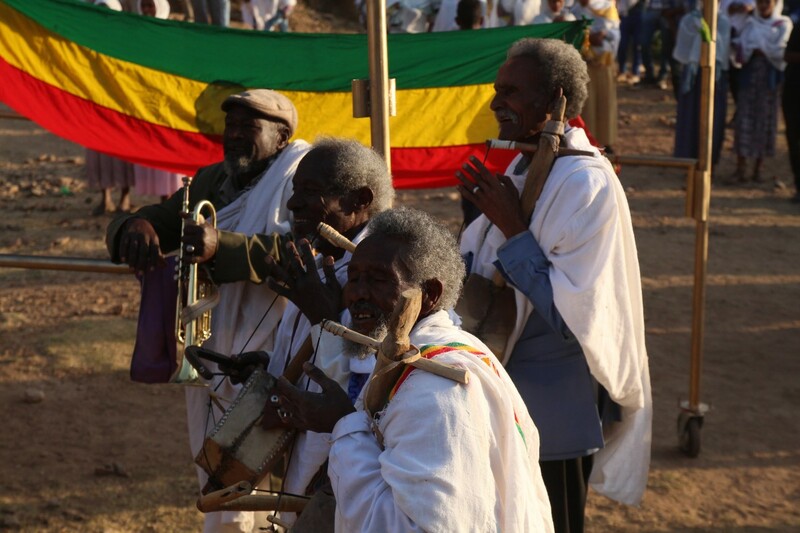 Timkat festival Ethiopia. Copyright Bunch of Backpackers. The next morning thousands of people gather around the Bath of Queen Sheeba for the ceremony. Timkat festival Ethiopia. Copyright Bunch of Backpackers. Ceremonies early in the morning involved red carpets, priest in colorful robes, colorful umbrellas, lots of incense and prayers. 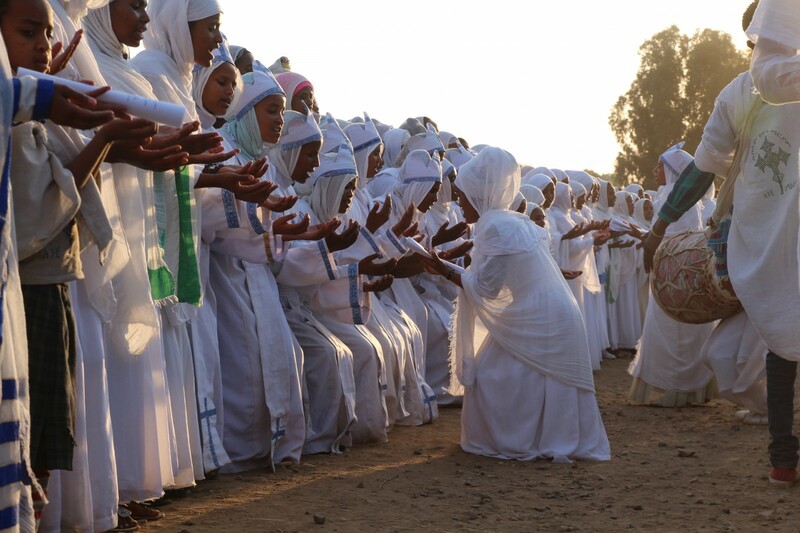 Timkat festival Ethiopia. Copyright Bunch of Backpackers. Facial cross tattoos are quite common, especially among the elderly. 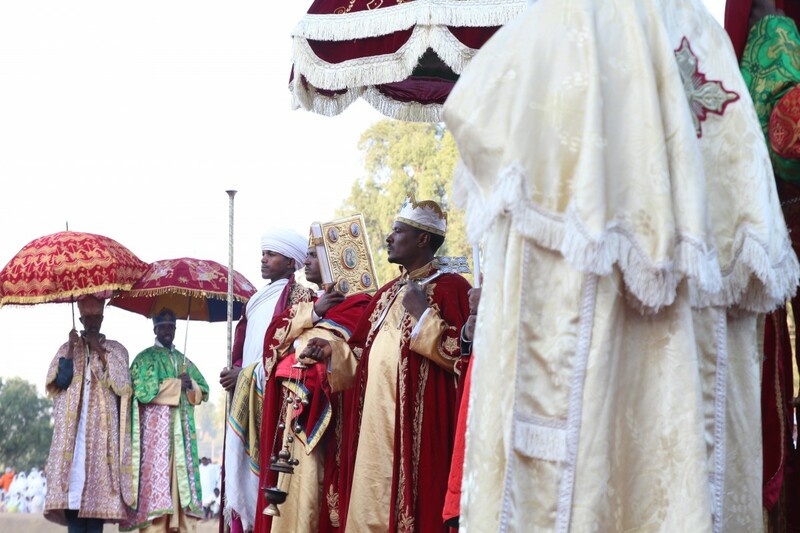 Timkat festival Ethiopia. Copyright Bunch of Backpackers. 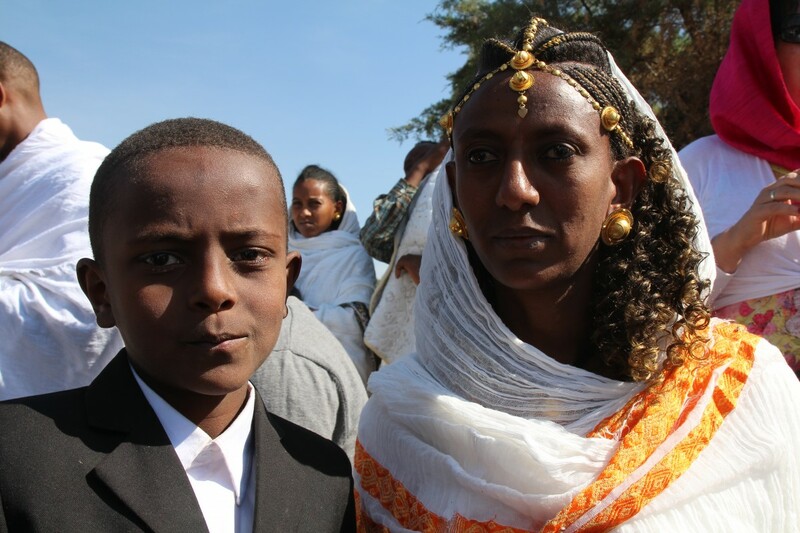 Mother and son, dressed up beautifully for the Timkat Festival. Timkat festival Ethiopia. Copyright Bunch of Backpackers. After the water was declared holy, it was time for the annual baptism. People would jump into the water of the baths of Queen Sheeba or wait for some water of the water hoses. Timkat Festival Ethiopia. Copyright Bunch of Backpackers. On the way home. Timkat festival Ethiopia. Copyright Bunch of Backpackers. 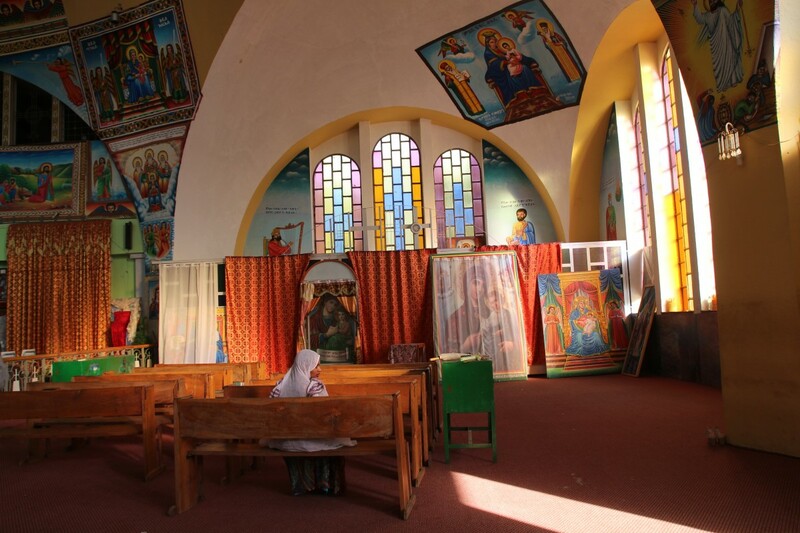 Inside the Orthodox church in Aksum. Timkat Festival Ethiopia. Copyright Bunch of Backpackers. 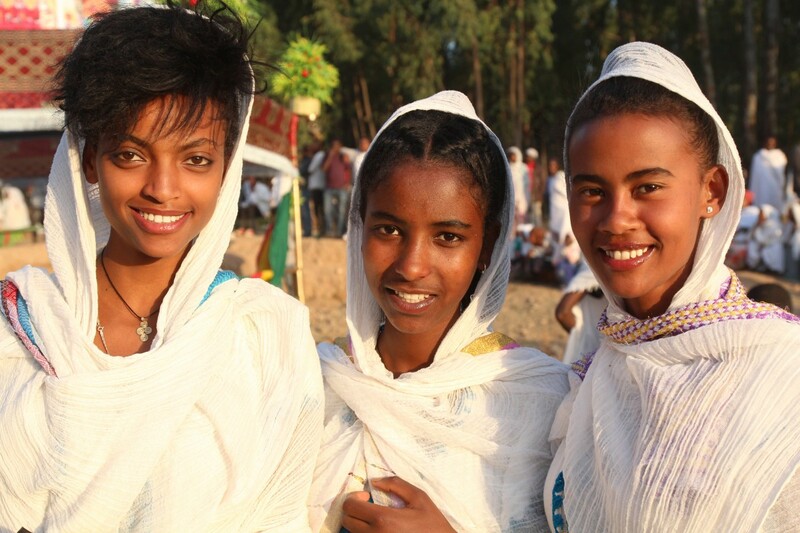 Young ladies during the Timkat festival. Timkat festival Ethiopia. Copyright Bunch of Backpackers. 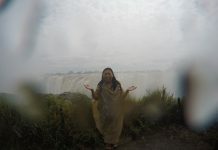 Getting some holy water from a bottle filled at the Bath of Queen Sheeba to sprinkle on my face. Unfortunately, I lost my head scarf. 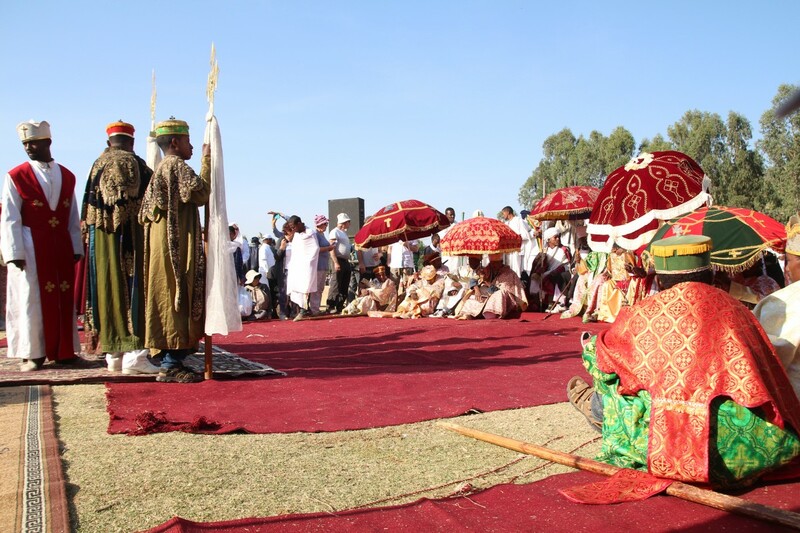 While most people head to Gondar for Timkat, I preferred to celebrate Timkat festival in Aksum. 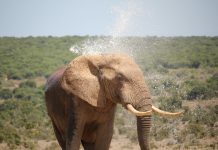 There were very few tourists (maybe two tour groups) and the celebrations were extensive and impressive. 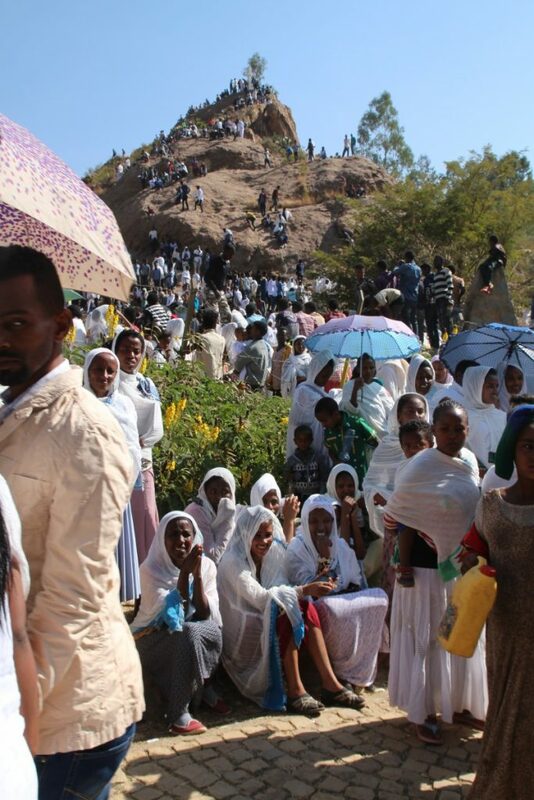 From what I heard, Gondar is extremely crowded during Timkat. 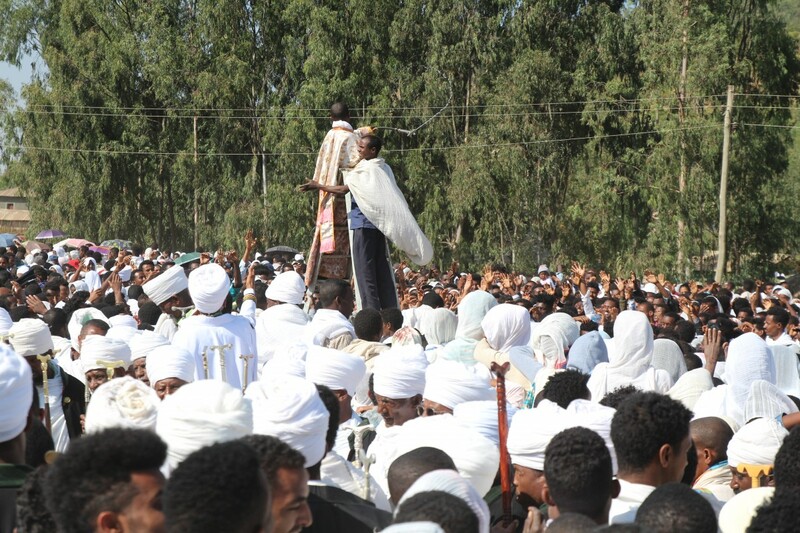 People also joked that all pickpockets from Addis head to Gondar during Timkat. 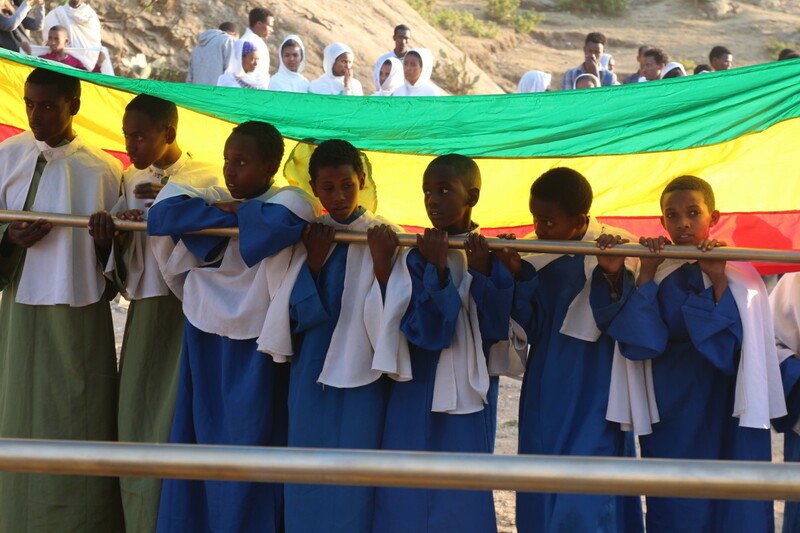 Consider to book your accommodation in advance during Ethiopian Timkat. Especially Gondar tends to be fully booked. During the festival season, public transportation is often fully booked. Keep this in mind and try to book your bus ticket at least the night before. Ask your guesthouse where and when to be for the festival. The festivities on January 19th start quite early in the morning. Please be mindful and respectful during the celebrations. 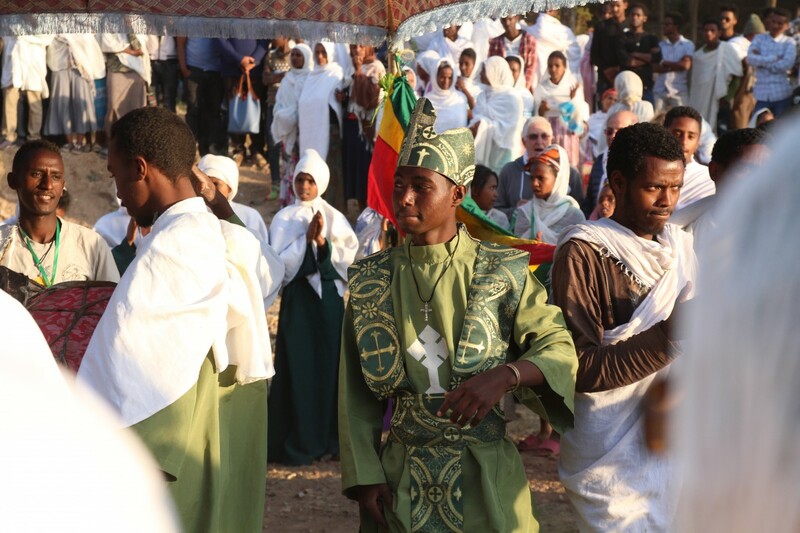 It’s an important religious ceremony for the Ethiopian people and we’re fortunate that we are welcome. Be invisible. Don’t disturb it with your photography, filming or drone. 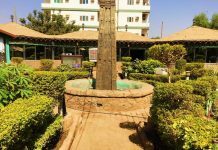 In Aksum I stayed in the Kaleb hotel, which has a beautiful garden courtyard and a popular pizza restaurant. 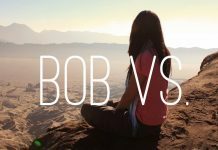 It has potential to be a great hostel for independent travelers, but during my visit I was the only backpacker. Would you love to visit this festival? 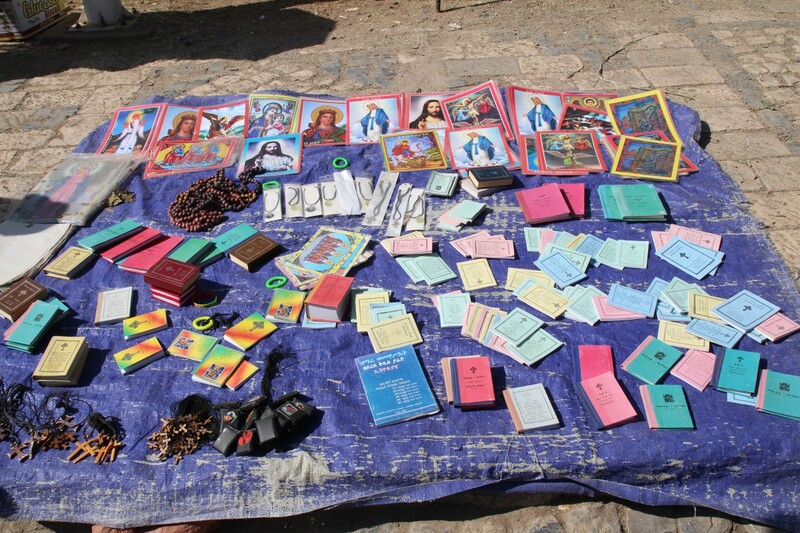 Have you been to similar religious celebrations? I entered Ethiopia from Sudan. Read more about my Sudan travels here. 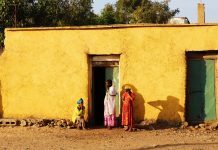 How to get an Ethiopian visa in Khartoum? Previous articleMoney Matters: How much does it cost to backpack Georgia? 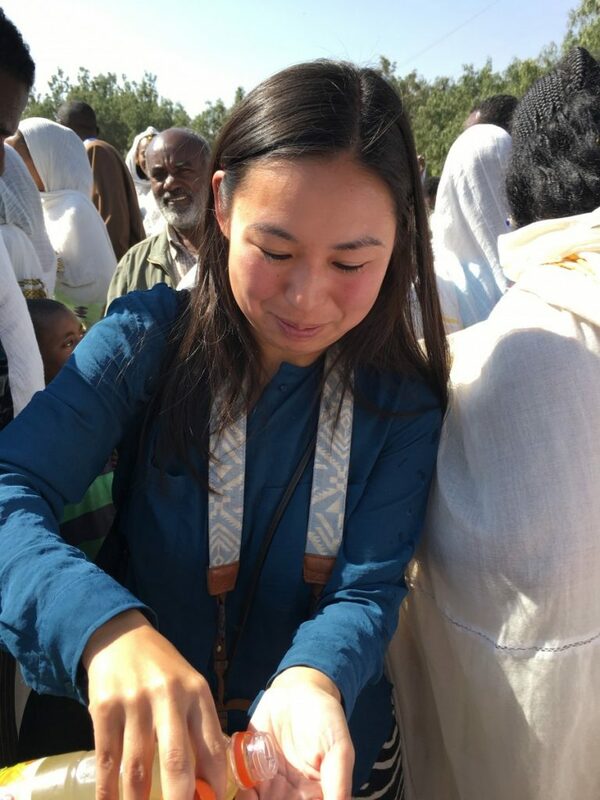 Next articleHow much does it cost to backpack Ethiopia? Money Matters: How much does it cost to backpack Uganda and Rwanda? 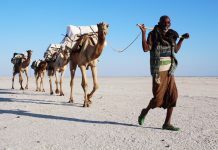 How to prepare for your Danakil Depression tour in Ethiopia? 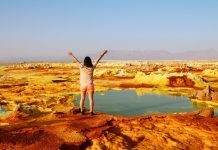 The Ultimate Guide to Backpacking Ethiopia: itinerary, budget and tips! 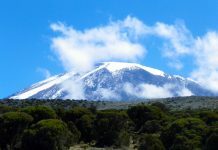 How much does it cost to backpack Ethiopia? 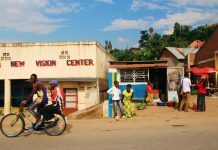 Guide to Backpacking in Zimbabwe: Route, costs and general tips! Don’t ruin your camera and 9 other tips for your visit to Victoria Falls! 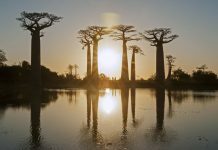 Money Matters: How much does it cost to travel in Madagascar?